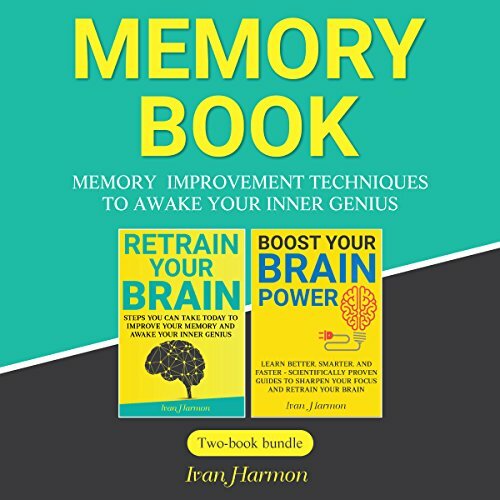 Memory Book: Memory Improvement Techniques to Awake Your Inner Genius includes two books – Retrain Your Brain & Boost Your Brain Power by Ivan Harmon. This is the comprehensive guide to your memory. No matter how many tricks exist on the market, the only real way to master your memory is to own it. It’s not just about quick tips and small tricks, it’s about growing your genius and taking control of your life. In this book, you will learn how your memory works and what you can do to become a life-long genius. You will learn real facts about your brain and memory, including steps that will improve your overall learning journey. The market is full of books that offer tricks, but this one is promising more. Discover the unique quirks and corners of memory that makes yours unique, because everyone is different and as such, we all think a little differently. This book will not only teach you useful memory improvement techniques, it will enable you to make these techniques work for you and your unique mind. The techniques that you learn in Retrain Your Brain: Steps You Can Take Today to Improve Your Memory and Awake Your Inner Genius are designed to help you with memory in any area of your life, including studying for tests, remembering important names, and memorizing long numbers.